Back home in Ludington after fishing in the Manistee Budwieser Pro/Am this weekend. The picture on the left was our catch on Friday the day before the tournament. We hit’ em pretty good up by Big Point Sable and were confident we could do it again on Saturday. Tournament start time is 6:00 a.m. so getting the early bite is pretty much out. We made the long run and shut down in the 04’s and trolled south. We didn’t have a bite until we were right on the Point. That was on an out down with a pair of regular size Dreamweaver Super Bread spoons set at 80 feet. We missed that one and didn’t hit another fish until we turned in the 02’s. The fishing was tough. Some boats were hitting fish north of the Point in 120 to 130 feet of water so we worked that water between the 04’s & 07’s. Bites were hard to come by. Our best rod was a 10″ Mountain Dew Spin Doctor trailed by a Cold Steel Big Water Tackle Meat Rig baited with an Erie Dearie Herring Strip. It went three times before a big King took it into a wire diver and borke it off. A 10″ Green Chrome Spin Doctor/Leprechaun Big Water Rig was good too. We only had 10 fish on and we boated seven of them. We were in 5th place at the end of day one. Only one boat weighed in a ten fish limit. We headed back south on day two stopping in the 07’s instead of running up to the Point. We set up in 90′. The graph was showing lots of bait and fish. We rode for a while before we hit our first fish. It was on a high wire diver out 180′ with a the 10″ Chrome Green Spin Doctor/Leprechaun Meat Rig. That one got off. The King fishing proved to be tougher on day two than it was on day one. We only boated three Kings Sunday. We ended up fishing for Lake Trout the last hour and a half of the tournament and boated eight of them. All the Kings we boated both days came on Spin Doctors and Big Water Meat rigs except one. The 10″ Blue Bubble/Blue Thunder, Mountain Dew/Cold Steel , Blue Chrome/ Blue Thunder & Dark Green Chrome/Leprechaun are the combos that took fish for us. We finished the day with eleven fish in our box but could only weigh 9 of them due the tournament rule only allowing teams to weigh no more than six Lake Trout. When the weigh in was finished we ended up in third place in the Pro Division. We also collected $100.00 for the third biggest King, a 14.70 lb. fish. That one took the 10″Chrome Green Spin Doctor/Leprechaun Meat Rig out 140 ft. on a low wire diver. It was a well run fun event even though the fishing was tough. Congratulations to Team Hambone for their first place finish and Trout Scout who finished second. Fished up north again today. Set up in 100 feet of water and trolled north along the Bank.First thing we noticed was the strong current from the north. We were backed all the way down and had two bags in and were still doing 2.1 at the ball on our Fish Hawk. Our rigger were set at 70, 80, & 90 feet. Our big White Paddle/Pickled Sunshine Action Fly took our first King. The 80 ft. rigger with a pair of Dreamweaver Super Breads went next. From then on most our fish came on our wire divers and coppers. 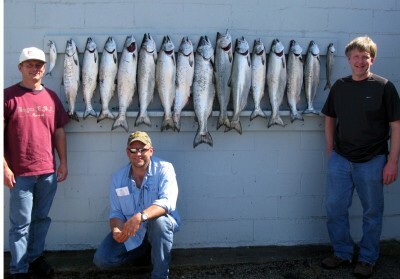 We took quite a few Kings on 10″ Spin Doctor/Big Water Meat Rigs and Erie Dearie Herring Strips. A 10″ Blue Bubble/Blue Moo was good on a 350 copper. We will be fishing out of Manistee the next few days in preparation for the MCSFA Budweiser Pro / Am fishing tournament this weekend.